Student work is assessed throughout the semester based on oral responses, student work, and the relationship between teacher and student. Every Friday, children have the opportunity to show and review their weekly progress to their parents, in a "Friday Folder" review session with student and parent. Cumulative assessments in the form of essay examinations are given near the end of each semester. After the completion of each semester, parents receive a “Report of Progress" detailing each student’s growth, strengths, weaknesses, and progress in habit formation. In addition, parents formally meet with their child’s teacher twice a year in order to build the essential connection between classroom and home. 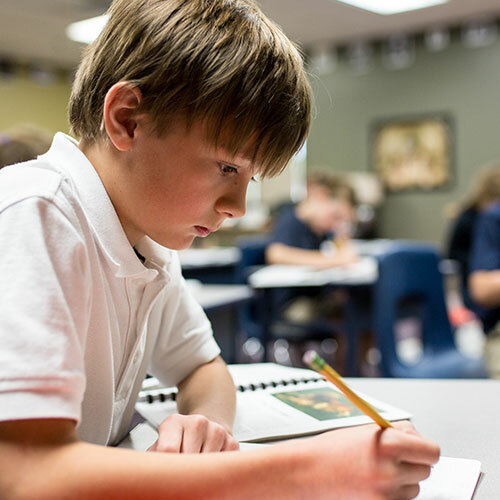 Middle school students are assessed in each of their class through projects, papers, and tests each term. Grades are given to demonstrate a student’s mastery and progress. In addition, a strong relationship and communication is emphasized between parents and the teacher in order to effectively train students in critical habits, disciplines, and virtues that they will need for life.